– the sky is brighter in the top image. – the grass in front of the group is more lit in the bottom photo. In other words, the accent is more on the guys in the top photo, since grass in front of them are less well lit. Both images were lit by a single off-camera softbox, using a speedlight. My on-camera speedlight was set to Master, but with its output disabled. Therefore only the Slave flash (in the softbox) was lighting the group. I liked the exposure on them after dialing down the flash exposure compensation to -2EV. The initial test images were blown out because of the predominantly darker tones in the image, so I had to pull down the TTL flash exposure. Since TTL flash is an automatic metering mode, the camera will try to expose for the overall scene as a mid-tone. And I had to over-ride that with my FEC. 1. The sky is brighter in the top image because I dropped the shutter speed from 1/50 (as in the bottom image) to 1/25 for the image at the top. I wanted more of the early evening sky to register. This is a classic example of dragging the shutter to allow more ambient light in. You won’t see camera shake because with the camera settings chosen, the guys would’ve been completely under-exposed. Black. Nothing. So you simply won’t notice camera shake. I could’ve pulled my shutter speed down even more if I wanted to. (My aperture was f5.6 and ISO was 800 for both those images). 2. The way the light falls off in the top image is on purpose. The image at the bottom came first. I felt the ground was over-lit. Too bright, and taking attention away from the guys. I therefore gave my assistant, the instruction to ‘feather the softbox upwards’. I purposely wanted less light on the foreground. By angling the softbox upwards so that the central area is pointing up instead of directly at the guys, I had less light spill on the ground. 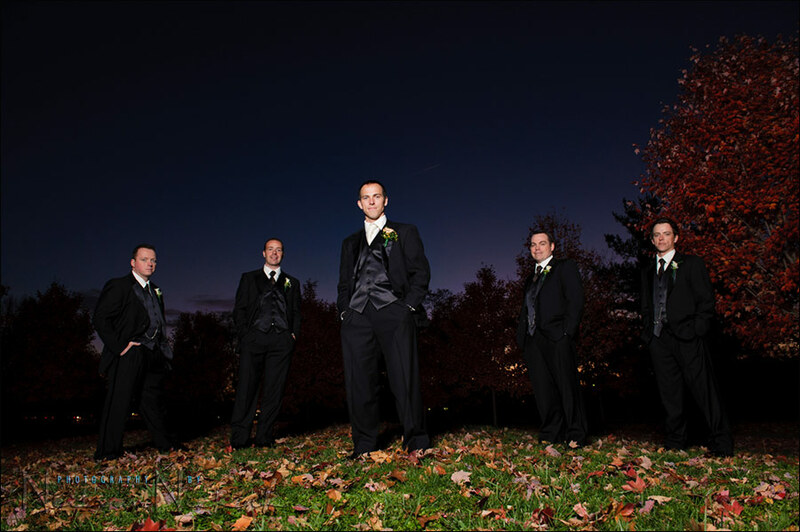 I still get enough light on the groomsmen, since the TTL flash exposure would give me the correct exposure still (for the FEC that I set). Directing the light away from your subject like this, using the edges of the ‘cone of light’ coming from your light source / softbox, is called ‘feathering the light’. You can do this to control the way the light spills, or to control how the light spreads across your subject. Hey Neil. With the groom in the foreground like this and with his fellas behind him the exposure looks pretty even on all of them. Taking the inverse square law into account, did the light have to be placed farther back to allow for a more gradual light fall-off? What was your focal length if I may ask? Thanks as always! Jason, I was shooting at 24mm, laying flat on the ground. 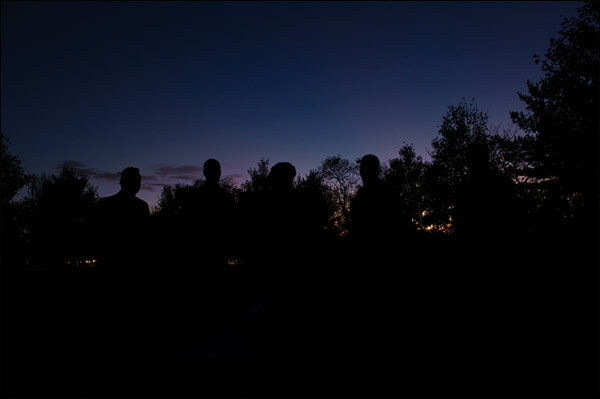 The groomsman on the left-hand side is a touch darker than I would’ve liked, but can easily be brought up with the local correction brush in Lightroom or ACR / Bridge. But I wanted to show here what it looks like directly out of camera, so we have a sense of what the lighting actually does. The softbox is to my left, and above and a little behind me. The light fall-off is gradual because the distance to the groomsman in the back isn’t that big a jump from the softbox, as the distance from the groom to the softbox. The ratio isn’t too extreme, and therefore the light fall-off isn’t too noticeable. I like the first image as the grass is dimly lit, something I need to keep in mind in my own pictures. I like the second photo as the lower halves of the humans are reasonably distinguishable from the background. Neil, if this were a model|workshop shoot and/or had reasonable time, would you have placed a flash in the back in order to separate the legs? parv … that would work very well. Hey Neil: Great stuff as usual. Thanks! Trying to understand your comment “So you simply won’t notice camera shake.” What if you were using a longer lens without image stabilization and without a tripod at 1/25 sec. The thing that is keeping the photo sharp is the short duration of a flash, right? (Given that the guys don’t move). Great article! But I am with Drew trying to understand your comment about no camera shake at 1/25 shutter speed. Is it because all of the real light hitting the subject is coming from the flash, and the ambient light is so low it does not matter? Drew, the ambient is so low it does not have a major impact aside from setting the mood. Not much of this ambient will register and the eye will be drawn by the sharp, well exposed parts of the picture. The ambient is low enough in this shot so first or second curtain flash won’t matter either. Even with a long, non-stabilized lens the short duration of the flash will freeze motion if the effect of ambient on the main subject is kept about two stops under. 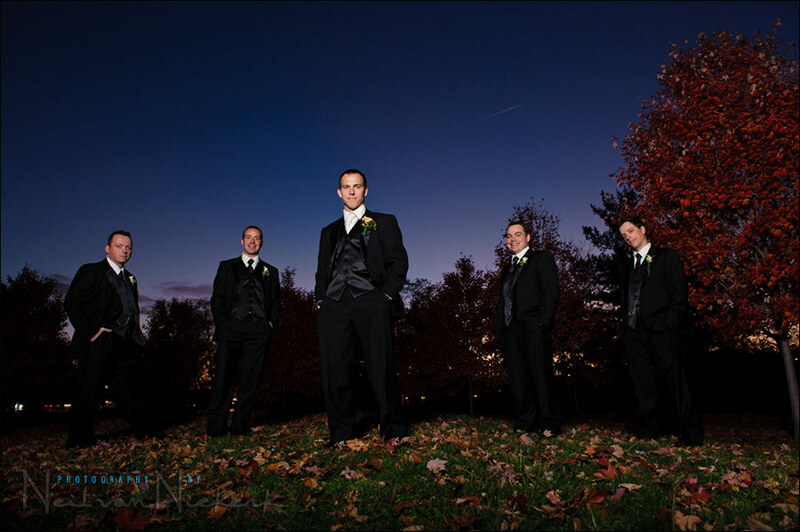 Here is an image taken less than 2 minutes after the groomsman shot. I had moved my position such that the Slave flash didn’t fire. The sky is already a bit darker in just that short time, but you will get an idea of just how dark it was without the flash, using those camera settings. It’s black. There’s nothing that registers in the foreground. Flash is a near-instantaneous burst of light, and will freeze most average movement, whether my subject or my camera’s shake. So I could’ve gone even lower without it being noticeable at all. Great article Neil. I actually use the black foamy thing on a Speedlight for a similar effect of blocking the light from lighting the foreground. Any tips on focusing when it is this dark? I’ve often had horrible luck with that and the times I’ve used the AF illumination my batteries zap out so fast it’s just frustrating! Thanks for all your help!!! I usually carry a small penlight/flashlight, very cheap, get someone to simply aim at a face so you can get an edge to lock onto, then get the ‘someone’ to turn off the light and take your shot. There are nearly always spare people hanging around during these shoots. You can focus much quicker with this method, especially if the subject if backlit a lot more, than using the AF illumination, I have found, stops lens doing a lot of ‘hunting’ for sure. Thank you Neil for great post and examples with very easy to follow explanation. I haven’t known the technique of feathering the light, but can see how well I can use it in some of my work. Joanna .. it has all kinds of uses. You can feather the light to reduce glare off surfaces in the background. Or you can feather the light as seen in the top photo here, to have equal light on both subjects. I love your site and all of your writings. There is a lot of great information. I am wondering when you say that you disable the output from your on camera flash how are you doing this. I have a d3 along with radio poppers. I am trying to have my on camera flash not affect my exposure and just let my off camera do all of the work, but can’t seem to figure it out. Thanks again for all of your great info. Christine … I think this might need a proper dedicated blog post. We’ll come back to this one.